Contribute the $5 suggested donation online. 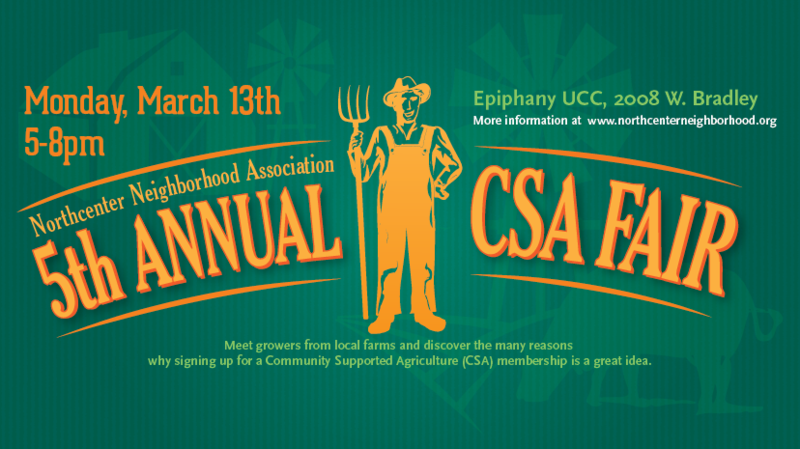 Save the Date for our 5th Annual CSA Night! $5 suggested donation at the door or feel free to pay the donation by registering online. This year's participating farms include: Mint Creek Farm, Scotch Hill Farm, Joe's Blueberries, Sandbox Organics, Sitka Salmon Shares, Willow Ridge Organic Farm, Collective Resources Inc, Chicago Market, Earth First Farms, and West Side Bee Boyz. This year, the farmers will be sharing their knowledge with you! We’ll present some ideas on how to plan for a day of on-farm fun this coming summer in the Southwest Michigan Fruit Belt. We’ll cover topics like getting there, maximizing your day, what to expect in resort towns, fun on the way back home and costs. What do all those current food terms really mean? Getting those buzz words better defined can make you an informed and better shopper. For instance, what's the difference between heirloom and heritage, organically grown and certified organic? If I'm buying eggs--what's the difference between cage free and pastured? What's the definition of sustainable? of nutrient dense? of natural? or, of local? What's the difference between hydroponic vs. aquaponic? What does "fair trade" mean to you and what do all those certifications mean? It really is a lot to sort out. Answering some of those questions will help you shop all the wiser. This presentation will talk about the learning curve of farming and what it's like getting into it nowadays. Learn how farming can impact our environment, animal welfare, and health. Global Garden Refugee Training Farm works with displaced family farmers who bring generations worth of knowledge and expertise to their new home. Learn about the challenges they face in urban environments like Chicago and how our farm offers healing and strengthens these new American families. Do you want to compost, to reduce the amount of waste you send to a landfill, but need help figuring out the pros and cons of composting yourself versus having someone else do it for you? Mary Beth Schaye, Zero Waste Consultant from Collective Resource, Inc. will compare and contrast backyard, worm and commercial composting and answer specific questions. How Can You BEE the Change! Learn how to help not only our honey bee population, but also what is being done to help the other 4000 species of native bees that are being endangered here in North America. Learn how subscriptions work for the core model of CSA and why CSA is important to sustaining ecology, community and health. All co-ops are based on the internationally recognized cooperative values of self-help, self-responsibility, democracy, equality, equity, and solidarity. Co-op members believe in the ethical values of honesty, openness, social responsibility, and caring for others. Across the country, we’re experiencing a new wave of interest in developing co-ops as communities seek to build better food systems and support local producers. Chicagoland is no exception- with two young grocery co-ops open for business and at least five more in development, co-ops may well be the next big thing in supporting local farmers.